One Day After Indictment, Former Chesapeake Energy CEO Dies In Car Crash : The Two-Way The Oklahoma City Police Department has confirmed that Aubrey McClendon died in a car crash Wednesday morning, one day after he was charged with orchestrating a conspiracy over oil and gas prices. 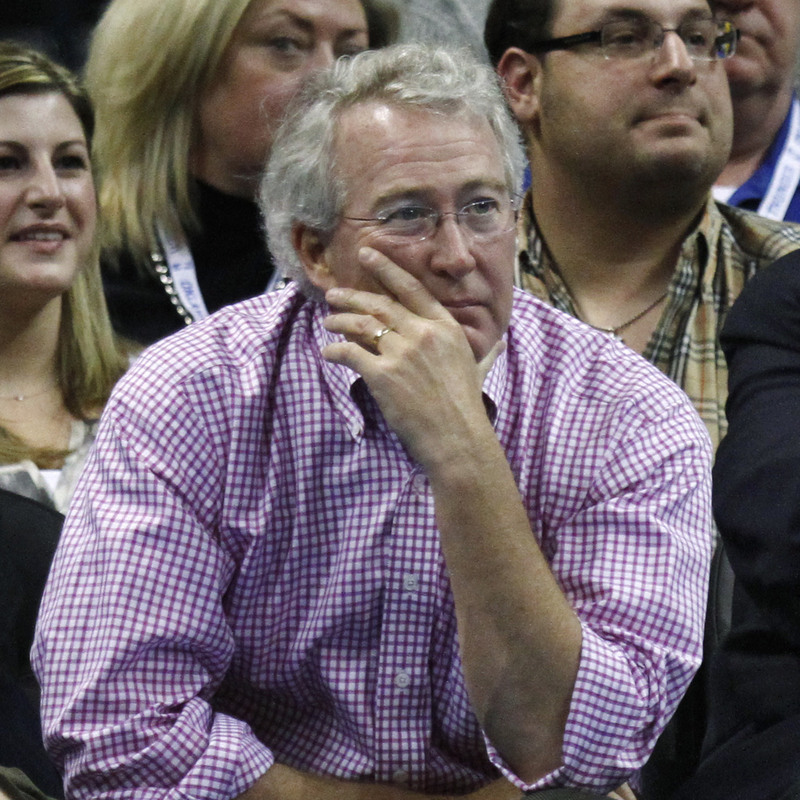 Aubrey McClendon (left), CEO and chairman of the board of Chesapeake Energy Corp., watches a basketball game in Oklahoma City in 2012. McClendon died in a car crash one day after being indicted on conspiracy charges. Aubrey McClendon, the former CEO of Chesapeake Energy Corp. who was charged Tuesday with orchestrating a conspiracy, has died in a car crash. The fatal crash occurred Wednesday morning, the Oklahoma City Police Department said on Twitter. A police spokesman said at a news conference Wednesday that McClendon's car was traveling at high speed when it crashed into an overpass wall and "was engulfed in flames." Capt. Paco Balderrama said no one else was in the SUV and that police were not initially able to determine whether McClendon was wearing a seat belt. The crash in northeast Oklahoma City apparently involved no other vehicles. McClendon, 56, was indicted Tuesday on charges of "orchestrating a conspiracy not to compete for oil and gas leases in northwest Oklahoma," as the Two-Way reported. The Justice Department described the indictment as "the first case resulting from an ongoing federal antitrust investigation into price fixing, bid rigging and other anticompetitive conduct in the oil and natural gas industry." The Associated Press reports that after his indictment, McClendon had released a statement in which he said, in part, "The charge that has been filed against me today is wrong and unprecedented. ... All my life I have worked to create jobs in Oklahoma, grow its economy, and to provide abundant and affordable energy to all Americans. I am proud of my track record in this industry, and I will fight to prove my innocence and to clear my name." Most Americans would not have recognized McClendon's name. But his impact on his industry, region — and actually, the whole country — was huge. Forbes magazine once called him "America's wildest wildcatter." McClendon was a leader in the efforts to extract oil and natural gas from shale formations. The drilling method came to be known as "fracking" and McClendon became its symbol of both success and excess. Fracking helped transform the energy industry, massively increasing the output of oil and gas. But to critics, fracking also opened up an array of new environmental dangers. McClendon's career was marked by enormous successes — and a slew of conflicts, lawsuits and accusations. Starting as an Oklahoma wildcatter, he transformed Chesapeake from a startup company that emerged from the early 1980s oil bust. He believed that acquiring drilling rights was the key to success in the energy business, so he became an aggressive buyer of land in Texas, Pennsylvania and elsewhere. He would then drill down into the shale rock below the surface to extract oil and gas. Eventually, his company ended up with rights to more than 16 million acres, and he emerged as a billionaire. The downside of his epic lease-acquisition spree was that his Oklahoma City-based company got loaded down with debt. Shareholders became unhappy with what Forbes called his "rampant conflicts of interest, lavish perks, reckless bets and failure to disclose that he had personally borrowed around $1 billion, some from Chesapeake's own lenders." In 2013, he was ousted as CEO of Chesapeake following a shareholder revolt led by Carl Icahn, an activist investor. McClendon denied wrongdoing at the time. He then went on to start a new enterprise, American Energy Partners. He also was a part owner of the Oklahoma City Thunder, a National Basketball Association team. Oklahoma Gov. Mary Fallin released a statement praising McClendon for his innovations in the industry and his civic generosity. She said he will be remembered as "a visionary who raised the profile of Oklahoma City." ESPN writer Royce Young also tweeted about McClendon's role in civic improvements in Oklahoma City. Go anywhere around OKC and you'll see McClendon's impact. From the zoo, to restaurants, to sidewalks, a major part of the city's growth.